The features described herein apply to all mixers on this page. The Model 308 55 gal. direct drive air operated drum lid mixer for liquids can be furnished with plain steel or Stainless Steel drum cover containing mounting holes - or less cover, for mounting on tank top. It is designed so only mixer shaft penetrates cover, thereby preventing abrasive material from entering shaft seal of motor - the most common cause of motor failure or oil contamination. Nylon bushing on cover prevents damage to shaft at entrance hole. The Model 308 motor will develop over 1-1/2 hp at 2000 rpm. Speeds may be varied from 0 to 2000 rpm by a turn of the hand wheel on the powerhead. Speed and horsepower are relative to the air line pressure and volume. Impeller, shaft and coupling are of type 304 Stainless Steel. The Fawcett Mixed Flow self-centering satin finish Impeller furnished as standard is 6" in dia. with high lift pitch. It is designed to quickly force settled material into suspension with a minimum of vortex and swirl. PMC-308 - 55 gal. Direct Drive Drum Lid Mixer (upper photo) consists of motor, motor mount, drum lid (plainsteel) with SB-30 Stainless Steel Shaft 30" long x 1/2" dia. and one MF-63H Stainless Steel Impeller, 6" dia. x 1/2" bore. Wt. 17 lbs. PMC-308/25 - Same as above but with 2 MF-53H impellersinstead of one MF-63H. PMC-308S - Same as above, but with Stainless Steel drum cover. Wt. 18 lbs. PM-308 - Same as above, less drum cover. Wt.13 lbs. PM-308/25 - Same as above, less drum cover with two MF-53HImpellers, 5" dia. x 1/2" bore instead of one MF-63H. Wt. 13 lbs. The features described here apply to all five of the 400 Series Mixers listed. The Model 104 Powerhead will develop over 3 hp at 2700 rpm. Speeds may be varied from 0 to 2700 rpm by a turn of the air control valve. Speed and horsepower are relative to air line pressure and volume (see performance graphs). The Mixed Flow impellers, sleeve couplings, and shafts are of type 304 stainless steel. 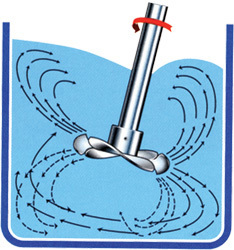 The impellers are a patented design, tried and proven superior for mixing liquids. They are easy to clean, light weight, and self-centering, making it possible to use smaller diameter shafts with no vibration. This means substantial reduction in overall weight - an important consideration affecting operator fatigue. PMC-408D - The powerful air-operated direct drive mixer is for use on a 55 gallon drum. It is shipped complete, including the heavy duty drum cover. Just a few bolts to assemble - nothing to buy. Connect the air line and you’re in business! This unit consists of the 3 hp Powerhead, Mount, Air Control Valve, Muffler, Heavy Duty Drum Lid, SC 30-1/2" x 5/8" Shaft, 2 MF-64HA Stainless Steel Impellers. AH-210 Oilproof Air Hose, AF-4 Manual Air Filter, and AO-4 Automatic Oiler. This mixer is hand portable. Wt. 33 lbs. PMC-408D/S - Same as above except drum lid is type 304 Stainless Steel. PMC-408TT - This powerful air-operated direct drive mixer is for use on the “tote tanks”. It is shipped complete, including the light weight tote tank cover. Just remove the cumbersome stirring paddles (if installed in yours) from the tank, drop the mixer in, tighten the cover, connect the air line and you’re in business! This mixer consists of a 3 hp Powerhead, Mount, Valve, Muffler, Heavy Duty Drum Lid, SC-40 Stainless Steel Shaft, 2 MF-64HA Stainless Steel Impellers, AH-210 Air Hose, AF-4 Manual Air Filter, and AO-4 Automatic Oiler. This mixer is hand portable. Wt. 38 lbs. PMC-408TT/S - Same as above except drum lid is type 304 Stainless Steel. PM-408 MIXER - Designed to mount on your tank. Consists of a 3 hp air operated Powerhead, Mount, Valve, Muffler, SC-40 Stainless Steel Shaft, 2 MF-64HA Stainless Steel Impellers, AH-210 Air Hose, AF-4 Manual Air Filter, and AO-4 Automatic Oiler. Wt. 29 lbs. The features described here apply to all five of the 500 Series Mixers listed. The Model 105 Powerhead will develop over 5 hp at 2700 rpm. Speeds may be varied from 0 to 2700 rpm by a turn of the air control valve. Speed and horsepower are relative to air line pressure and volume (see performance graphs). The Mixed Flow impellers, sleeve couplings, and shafts are of type 304 Stainless Steel. 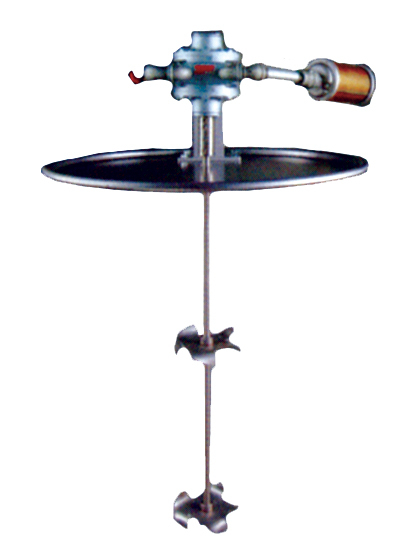 The impellers are a patented design, tried and proven superior for mixing liquids. They are easy to clean, light weight, and self-centering, making it possible to use smaller diameter shafts with no vibrations. This means substantial reduction in overall weight - an important consideration affecting operator fatigue. PMC-508D - The powerful air-operated direct drive mixer is for use on a 55 gallon drum. It is shipped complete, including the heavy duty drum cover. Just a few bolts to assemble - nothing to buy. Connect the air line and you’re in business! This unit consists of the 5 hp Powerhead, Mount, Air Control Valve, Muffler, Heavy Duty Drum Lid, SD 30-1/2" x 3/4" Shaft, 1 MF-85HA Stainless Steel Impellers, AH-210 Oilproof Air Hose, AF-4 Auto Air Filter, and AO-4 Automatic Oiler. This mixer is hand portable. Wt 33 lbs. PMC-508TT/S - Same as above except drum lid is type 304 Stainless Steel. PM-508 MIXER - Designed to mount on your tank. Consists of a 5 hp air operated Powerhead, Mount, Valve, Muffler, SD-30 Stainless Steel Shaft, 1 MF-85A Stainless Steel Impellers, AH-210 Air Hose, AF-4 Auto Air Filter, and AO-4 Automatic Oiler. Wt 35 lbs. PMC-508D/S - Same as above except drum lid is type 304 Stainless Steel. PMC-508TT/S - This powerful air-operated direct drive mixer is for use on the new "tote tanks". It is shipped complete, including the light weight tote tank cover. Just remove the cumbersome stirring paddles (if installed in yours) from the tank, drop the mixer in, tighten the cover, connect the air line and you're in business. This mixer consist of a 5 hp Powerhead, Mount, Valve, Muffler, Heavy Duty Drum Lid, SD-40 Stainless Steel Shaft, 2-MF- 85HA Stainless Steel Impellers, AH-210 Air Hose, AF-4 Auto Air Filter, and AO-4 Automatic Oiler. The mixer is hand portable. Wt. 38 lbs. New type where absolute minimum noise pollution and maximum clean air are desired. These “throw away” mufflers will not only reduce motor noise to a whisper, but will also clean moisture, dirt, oil droplets and vapors, some gases and bacteria from the motor exhaust. Will last from 2 to 8 months depending on use. For all motors up to and including the LS-104A, 3 hp. K1-6 for 1/4" NPT. MO-7 for 1/2" NPT. Each unit comes with a bung mount powerhead and all the connections for easy use and transfer between containers. A high torque powerhead is also available for difficult to agitate high viscosity materials. Optional accessories: AF-3 filter, AH-5 hose and AO-3 oiler. This efficient and powerful hand held mixer is perfect for quick, on-the spot agitation of low viscosity materials in containers up to 5 gallons. It utilizes a stainless steel shaft and patented MixedFLOW™ high performance impeller, which help to reduce vibration, weight and clean up time. For safe and efficient liquid mixing the Mixed Flow Impeller embodies patented features obtainable in no other stirring device. A circular, axial and radial turbulence is created by the pitch of blades giving excellent shear, forcing solids off the bottom with minimum swirl and vortex, and maintaining ideal distribution of suspended material. Flow is primarily down. When two or more impellers are employed on the same shaft in high viscosity material, identical pitch will give superior results rather than reverse pitch which must be used with cast propellers for the same purpose. In the majority of applications it is unnecessary to use baffles to facilitate mixing. This impeller also works equally well when positioned vertically or at any angle. The light weight of the MIXED FLOW IMPELLER in comparison to cast propellers allows use of smaller diameter shafts, reduces vibration to a minimum and provides a definite safety factor at higher speeds. The flowing design and pitch of blades creates a self-centering action, and if walls of container are accidentally contacted during mixing operation, shock and the possibility of damage to impeller or container is reduced to a minimum. Please note that the above advantages are obtainable without the addition of hard to clean centering rings or vertical fins. Thorough mixing without the addition of air can be obtained by reducing the speed when using the regular pitch impeller. Aeration, shear and violent agitation can be obtained with the high lift pitch impeller running at higher speeds, control of which is handled by a simple needle valve. As a rule, use REGULAR PITCH for low to medium viscosity liquids and HIGH LIFT for medium to high viscosity liquids. MF-21R, 1-7/8" dia. x 5/16" bore, regular pitch S-9, 9"long x 5/16" dia. MF-22R, 1-7/8" dia. x 3/8" bore, regular pitch S-12, 12" long x 5/16" dia. MF-31R, 3" dia. x 5/16" bore, regular pitch S-15, 15" long x 5/16" dia. MF-32R, 3" dia. x 3/8" bore, regular pitch S-18, 18" long x 5/16" dia. 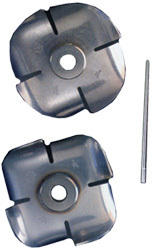 MF-43R Impeller, 4" dia. x 1/2" bore, regular pitch S-24, 24" long x 5/16" dia. MF-53R, 5" dia. x 1/2" bore, regular pitch SA-9, 9" long x 3/8" dia. MF-63R Impeller, 6" dia. 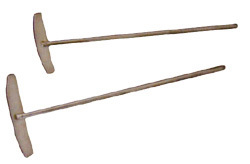 x 1/2" bore, regular pitch SA-12, 12" long x 3/8" dia. MF-64R, 6" dia. x 5/8" bore, regular pitch SA-15, 15" long x 3/8" dia. MF-21H, 1-7/8" dia. x 5/16" bore, high lift pitch SA-18, 18" long x 3/8" dia. MF-22H, 1-7/8" dia. x 3/8" bore, high lift pitch SA-24, 24" long x 3/8" dia. MF-31H, 3" dia. x 5/16" bore, high lift pitch SB-12, 12" long x 1/2" dia. MF-32H, 3" dia. x 3/8" bore, high lift pitch SB-15, 15" long x 1/2" dia. MF-43H, 4" dia. x 1/2" bore, high lift pitch SB-18, 18" long x 1/2" dia. MF-53H, 5" dia. x 1/2" bore, high lift pitch SB-24, 24" long x 1/2" dia. MF-63H, 6" dia. x 1/2" bore, high lift pitch SB-34, 34" long x 1/2" dia. MF-64H, 6" dia. x 5/8" bore, high lift pitch SB-40, 40" long x 1/2" dia. MF-84H, 8" dia. x 5/8" bore, high lift pitch SC-30.5, 30.5" long x 5/8" dia. MF-85H, 8" dia. x 3/4" bore, high lift pitch SC-34, 34" long x 5/8" dia. SC-40, 40" long x 5/8" dia. SD-30.5, 30.5" long x 3/4" dia. SD-34, 34" long x 3/4" dia. SD-40, 40" long x 3/4" dia. 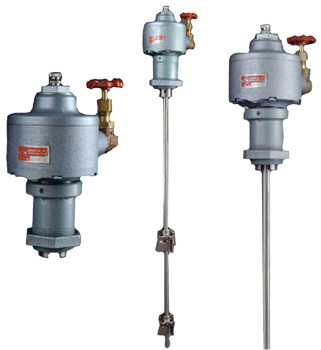 These stirring devices are for use with our gear driven laboratory powerheads to mix highly viscous materials in quantities up to two gallons in open or closed containers. They are self-balancing, easy to clean, safe, and practically indestructible. The paddles are permanently mounted to the center of the shaft allowing higher speeds with no danger of vibration or breakage. They can be used in conjunction with packing gland or stuffing box. The air hose is a high grade heavy duty oilproof type. It comes in 1/4" ID for the 10A, 11A, and 22A motors and in 3/8" ID for the 20A and 30A motors. Standard lengths with fittings are listed with each mixer, or any length with fittings can be furnished at cost per foot.